"When Steward Edmund Rounds and Sir Cumference notice that there are strangers camped nearby, the steward's son, Rounds II, decides to find out more. When he reports that an enemy is lying in wait, everyone moves quickly to defend the castle. But wait! How can Rounds II figure out how many bows and arrows they have in time to create an appropriate battle plan? Using rounding techniques to figure out the totals more quickly, Rounds II helps stave off a potentially disastrous attack." Start reading Sir Cumference and the Roundabout Battle on your Kindle in under a minute. This latest series installment uses stories involving a knight named Sir Cumference as jumping-off points to explore mathematical concepts tackles rounding. Edmund Rounds and his son, Rounds 2, are responsible for keeping an inventory of items at Sir Cumference's castle. When Rounds 2 hands over his latest counts for inspection, Edmund notices that the number of bread loaves and butter pots has not been totaled. Rounds 2 admits that adding is the difficult part. As they total the items together, he finds that it is much easier to calculate numbers in groups of 10 (10, 20, 30, etc.). His father tells him that for some items, such as the number of bees in the hives, it's acceptable to come up with an approximate number. To thank his father for his assistance, Rounds 2 sets off to count the bedding of some travelers passing by but discovers that the men are enemies intent on attacking the castle. As Sir Cumference prepares for battle, he asks Rounds 2 to retrieve the bow and arrow counts. While these items have been counted, they have not yet been totaled, and Rounds 2 is left to complete the calculations himself. By rounding up or down to the nearest 10, Rounds quickly completes the task in what soon becomes known around the castle as the Rounds 2 Method. VERDICT Complete with the illustration style and subtle puns expected of the series, this title will be enjoyed by fans of the previous books. "Cindy Neuschwander is an elementary school teacher who loves teaching math. and was inspired to write the Sir Cumference series while visiting medieval castles in England." 5.0 out of 5 starsFun escapades teach geometry painlessly! Some years ago, we stumbled upon these books at the library. They were an instant hit - every single one in the Sir Cumference series! We check out lots of books but this one the children remembered. In fact, we hadn't checked these out for a couple of years when one son started a new geometry section in math and asked me to get these again so he could review! My preschooler thinks of these as fun stories and enjoys the illustrations while the older crew is making the connections to mathematical concepts they are learning. For example, one child always keeps diameter and radius straight because of the book characters (Radius is the little guy!). I highly recommend this series as enjoyable literature that will help your children remember their geometry. The books also have an object or character (jester, seagull, rat, cat, etc.) that appears on most pages which is an extra bit of fun to look for. I love the rich colors and oil painting technique too (I may be wrong about the oil painting but that's the feel of it). I decided these belong in our home library and was especially pleased that Amazon was running its buy 3 get 1 free promotion just then. 5.0 out of 5 starsHoping for more books in the future. Big fan of Cindy Neushwander's Sir Cumference series. We have them all so it was nice to find a new installment. We had been reading this series to our daughter when she was five years old. She loves them now even at seven. Earlier, she didn't understand the mathematical concepts in the books but over time she began to "discover" things about the book and would run tell us. Love that the author was able to engage children and make math concepts not only fun, but able to show them in use throughout the books. 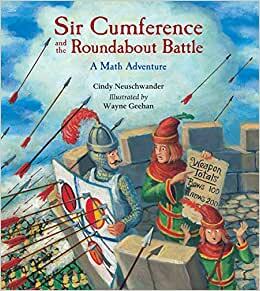 The Sir Cumference books are great for kids interested in math. My 8yo son, who loves math, devours these, though my 8yo daughter who is not interested in math, finds these uninteresting as well. But they teach concepts in a really great, fun way. We enjoyed this book a lot. In fact we enjoy most all of the Sir Cumference books alot.